Affordable phones make compromises, but the G7 Power emerges with outstanding battery life, backed up by performance that will suit many just fine. There are lots of affordable phones out there, but the Moto G7 Power has something that the rest of them don't: true two-day battery life per charge. Moto G is Motorola's best-selling family of devices. Launched back in 2014 to appeal to a younger user with tighter budgets , the G family has moved from budget darling to surprisingly powerful in recent iterations. With the launch of the Moto G7 Power, however, there's one target in Motorola's sights: battery life. It's one of the biggest complaints of smartphone users. With its 5000mAh battery, the Power promises to outlast pretty much everything else on the market. And Motorola hits it out of the park with the Moto G7 Power, resulting in a phone that's outstanding in its endurance - and seriously good value for money. Stuffing a big battery in a phone leads to one thing - increased weight. That's one of the first things you'll notice about the Moto G7 Power - it's a pretty hefty device. Weighing in at 193g, it's heavier than most flagship phones, while its 9.3mm thickness makes it feel pretty substantial too. Fortunately, Motorola has done much to mitigate the size with nicely curved edges - so it's not too unwieldy in the hand. Obviously, this isn't just chunk for the sake of chunk - when you're cutting through a weekend and you're still on your first charge, you'll be understanding of that size for the sake of battery. 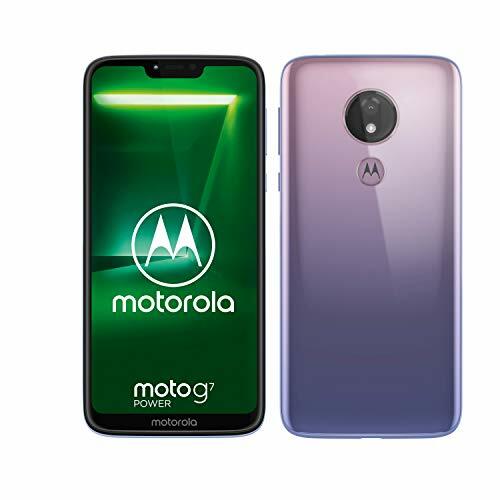 The design doesn't deviate too much from previous Moto G outings, coming here in black, blue or a violet gradient colour (which we've not seen). For the black phone it's a glossy finish and no sooner have you lifted it out of the box as it will covered in fingerprints. But there is a clear case in the box which does a great job of protecting the phone and making it super grippy, although it does make the phone even fatter. Compared to the regular Moto G7 and the G7 Plus, we have to say that the G7 Power doesn't look quite as premium, but it's a healthy step better looking than the Moto G7 Play, its cheaper sibling. The Power's design is a little conservative and compared to some of the fancy finishes now available it's hardly exciting - but retailers are always telling us that people buy "safe" colours, so perhaps that's by intention. We also like the position of the speaker. It uses the ear speaker as the loudspeaker, so if you're playing games this fires sound towards you and you're a lot less likely to block it with a hand when you're holding the phone. One of the key elements of the design is the notch at the top of the display. On the G7 Power you have a wider notch than the G7 and the G7 Plus - both of which carry a dewdrop-style notch that looks a little more contemporary. That notch sits atop a 6.2-inch display with an HD+ resolution (1520 x 720 pixels). That's not hugely detailed and it's on the edge of acceptable resolution at this size - and sometimes it's not quite as sharp as you might like - but there's all the colour, vibrancy and potential brightness to counter direct sunlight that you'll need. If you demand more resolution then the Nokia 7.1 is better - but it also costs £100 more. However, there are a few downsides: firstly, the auto-brightness is a little lacklustre, often dimming too aggressively; secondly, you'll find that when apps fill in the black spaces to the sides of the notch that it's not a really deep black - it still glows - because it's an LCD display and those black areas are still emitting some light, unlike a glorious OLED alternative; lastly, and it's a minor niggle, is that the polarising layer is linear - so if you hold the phone in landscape when wearing polarised glasses it will be completely dark. When it comes to the hardware, the Moto G7 Power sits on the Qualcomm Snapdragon 632 platform - the same core hardware as the Moto G7 and the G7 Play - along with 4GB RAM and 64GB of storage, with microSD support up to 512GB. This is a mid-range eight-core hardware. It's still pretty powerful, though, and we've found it perfectly capable at running demanding apps, like PUBG Mobile, although this drops down to the lowest graphics settings. That means things don't look quite so glorious, but we've still managed to take home plenty of chicken dinners, so it doesn't mean you can't then compete. Daily tasks and switching around apps is plenty fast too. It's a slightly slower experience than the best phones out there, but for a fraction of the price that really doesn't matter. We have found that sometimes things can get a little slow when there's a lot of data activity going on - downloading and installing updates for example - but we also found a bigger issue with data latency or handover, sometimes losing a connection when moving from Wi-Fi to 4G, for example. This manifests itself when leaving home Wi-Fi for example. All phones hang on to the Wi-Fi and then there's a slight pause before you're back on 4G, but in the case of the Moto, we've been left with nothing for several minutes on occasions. This isn't a huge problem - we've not found ourselves unable to get a connection - or had any problems with connectivity when on either Wi-Fi or 4G, but it's something you might notice in use. The rear fingerprint scanner is fast to unlock and there's a 3.5mm headphone socket too, for those not yet ready to move over to Bluetooth headphones. There is no NFC (near-field communication), however, so you'll be denied contactless payments. Overall, having come to the Moto G7 Power from a flagship-level phone, it's hard to find any major problems with the performance. This isn't a case of stepping into an under-powered phone; quite conversely, it feels like you're getting good performance for the price you pay. Of course the big story here is the battery. At 5000mAh it has a massive capacity, especially compared to the 3000mAh across the rest of the G series range (and in many comparable competitors, too). It comes with a 15W TurboPower charger in the box, while there's a USB-C connection on the base - so when it does come to recharging, it doesn't take long. That battery will also last you through 24 hours with ease; even during long days, with plenty of hotspot use and a couple of hours of PUBG gaming, we're still finishing the day with 50 per cent charge. Lighten up the use a bit and you're looking at a phone that doesn't need charging every day. This is where the Moto G Power makes its case: it will outlast pretty much every flagship phone on the market and that means you're really getting something for your money that others don't offer. We'd even go as far as saying that for the sheer convenience of that battery - the assurance that you can head out the door and not have to worry about charging when you're out - that other performance sacrifices are worth accepting. Motorola has been giving its users a pretty clean software experience since the launch of the Moto G family. Now running on Android 9 Pie - the latest version of the Google software - you'll once again find that it's clutter free. It's not as clean as the Android One build - which you get from affordable rivals Nokia - so there are some Moto features you can use to customise the experience. You're blissfully spared pre-installed apps, which is a welcome relief, so there's nothing to uninstall or hide to get you started - and that gives this phone a major advantage over some of the affordable rivals, like the Xiaomi Redmi S2. There are Moto Actions included - a range of gestures to automate some actions as well as some display tweaks you can make. It's all standard Motorola stuff and all worthwhile. There's no Moto Voice here, however, as you'll find in the company's models higher up the range. What we like about the Moto G experience is the purist of Android. It looks and feels very much like the Google Pixel; it's fast and fluid and it's a welcome relief to not be fighting the software to get it to do basic things - which is the problem with some skins. That just leaves you to install your apps and off you go - which makes for an enjoyable experience. There's no dual camera on the Moto G7 Power - that's saved for the Moto G7 and G7 Plus - so instead you get a single 12-megapixel rear camera, powered by a custom Moto camera app. The camera performance from the G7 Power is pretty average - this isn't going to muscle-in on the likes of the Pixel 3 XL or Huawei Mate 20 Pro to compete for the top spot - but it's not entirely bad either, and certainly faster than in previous years. In good daylight conditions it's a perfectly reasonable camera, both front and back. You get plenty of detail and vibrancy; although there's no AI mode (artificial intelligence) to boost your pictures like some competitors - although if you're using Google Photos it will boost some photos for you if needed. There is HDR (high dynamic range), but it's not quite as adept as some - and in some cases it's difficult to see if it's doing anything at all. Google Lens is integrated, meaning you can point and identify objects or quickly extract information that the camera can see. You'll also get Active Photos if you want this feature, which gives you a short video capture with your photo, so there's movement included. Video capture also runs up to 4K at 30fps. There is also a portrait mode, using face detection to identify what should be in focus and what shouldn't. It works reasonably well, blurring the background using software, although there can be some confusion where it goes overboard - in which case it's better to use the manual mode and dial down the effect a bit so it's not so obvious. Portrait mode the front camera also offers a skin smoothing beauty mode, if you want it. But in low-light conditions the weaknesses come crashing through: longer exposure leads to blur, high ISO sensitivities lead to image noise and this is where the Moto G7 Power is really marked out from the best cameras out there. Does that matter? At this price, probably not - because this phone camera is as good as many flagships from a couple of years ago. Just don't expect too much when the light dips. The Moto G7 Power has a lot of strings to its bow. It sits at the affordable end of the Android spectrum, providing unbeatable battery power at a great price point. There's a big display, expandable storage, bloat-free software, and enough power to attack most things - even if you need to let the settings slide. On the downside there's a slightly weak camera in low-light conditions, a display that is on the weak side with over-active auto-brightness adjustment, and the design is rather chunky. The question is whether you are happy with such compromises. All phones in this sub-£200 price bracket compromise somewhere - and many don't have anything to offer but a low price. For the Moto G7 Power the story is different: it has that huge battery capacity, which is something that's well worth paying for and something that makes this long-lasting beast stand head and shoulders above its low-price rivals. Nokia sits in a similar position, offering affordable phones on the Android One software platform. The 7.1 offers a similar hardware setup to the Moto Power, but lifts the display quality and offers a dual camera on the rear - hence it being a little pricier. Can is compete on battery life though? No. The Honor Play is a strange beast. It pretty much offers flagship level hardware and comes in a price that's falling due to it being a 2018 phone. There's a good camera and lots of power, with a more capable display than the Moto. However, the Honor won't match the battery life and its software is a lot more fiddly.